SQLSITE: A Pre-configured SQL/Application Server based portal product. Open this saved excel sheet. This demo will show the statistics capabilities of SQLSite. It will connect to the live instance running on www.siilats.com. You have to install ptsfull.exe if you have Office 2000 and not Office XP. If this link fails, the local copy is http://www.portfolix.com/windows/ptsfull.exe. Find ptsfull.exe under msolap/install/pts subfolder. Double click ptsfull.exe to install. 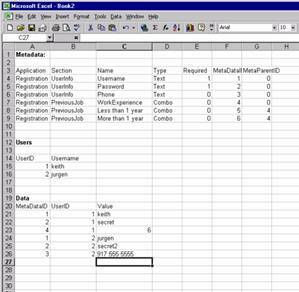 Restart Excel and the Sqlsitedemo.xls sheet will connect to live data. Detailed instructions for installing the demo. Following is an overview of a portal based product. A sample working versions are on www.siilats.com/english and www.recwiz.com . This product is the combination of 7 years of IT consulting for various Internet and fortune 500 financial companies who all pretty much want the same thing, combined with some smart architecture and the new .NET based robust secure server architecture from Microsoft. We have applied the product successfully to the following industries. A further installation in one of those industries will cost $10k. A new industry would cost $20k. They gather CV-s and job descriptions, usually specializing in a certain job segment, and then allow searching and browsing of the Jobs/CV-s charging money for the “detailed” view. They also need email alerts etc. Lots of companies want to maintain a database of clients to send them promotions and other informational emails. They can track the movement of clients in the site and with that info improve the layout and use CRM marketing tools to target promotions. SQLSITE also includes a simple shopping cart, which is updateable from an Excel sheet. This is unique in the industry. Everyone else talks about “robust java swing data entry applications” which in practice means sales people have to copy data from their excel sheets to a web page form. SQLSITE will add a 2 buttons to the corner of the excel sheet labeled “upload” and “refresh”. Parts of the portal are used to manage two of the major investment bank websites. Due to confidentiality agreements clients can not be named but please enquire for more information. We have applied the portal to the Driving School market in New York area. Driving schools schedule appointments with the Government agency, which has long queues. Part of our enhancement to the standard SQLSITE product involved developing an automatic monitoring system that would check for empty spots in the Government Driving test schedule and allow users to book them. We have a comment module that allows articles to be published and comments to be added to them. www.mega.ee and www.siilats.com/english are examples. Microsoft has turned its attention to servers market with .NET and its going to have the same impact than the Windows NT operating system had. Our solution is a fully redundant three tier system with SQL database, that is at the same time built very transparently so that even a novice network administrator will understand it. Extensibility and openness of standards. Problem with Microsoft is that you do not know what is happening. That is why we have built the business logic parts in simple visual basic and a few SQL stored procedures, so that if need arises one can modify or debug the system very easily. Because our architecture separates design and business logic we have a dedicated team of designers that can specify the look and feel to your liking. Furthermore, different parts of site can look different if required. We normally rely on the client hosting the database internally (unlike ASP) due to the security, accessibility and cost reasons. However, we can provide hosting in our shared environment with 2 firewall (a Cisco filter and a Linux proxy) and 2 redundant IIS/SQL servers. In the client site a dedicated machine is normally bought with windows 2000 server, sql2000 standard edition, IIS5, office XP and Visual Studio (a cost of around $5k). We will then work with the local system administrator to make sure that they fully understand the configuration of the server. If capacity requires, a second server operating in a clustered mode is added to the company network. The .asp pages will contain all the design elements and use the standard COM components and ADO access to SQL server stored procedures to perform the data entry and retrieval functions. The components are combined in an intuitive Visual Basic for Application script that validates the inputs and takes care of the special design effects.